The Arab parties of Balad, Hadash and United Arab List, which decided to run on a joint list on Thursday, introduced the new union on Friday and declared their goal: to rid the Knesset of “the extreme right”, as they put it. Members of the new united party gathered for a press conference in which they unveiled the make-up of the new list, noting that the union was reached despite the major differences in interests between the parties that represent different regions, populations, ethnic groups, and ideologies. Aiman Ouda, who was placed in the number one spot on the new list, predicted that it would receive 15 seats in the elections, four more than a poll released on Thursday found. 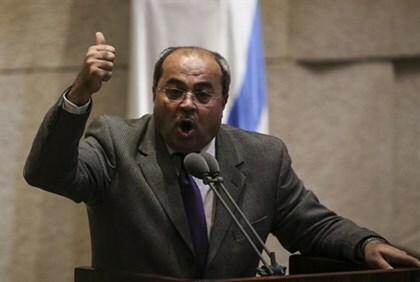 MK Ahmed Tibi, who was placed in the #4 spot on the new joint list, mocked Liberman and said that the credit for getting all the Arab parties together should go to the Foreign Minister. “Liberman and the extreme rightists raised the threshold to push the Arabs out of the Knesset. Today we are closer to the top and closer to the threshold, and we hope that [Liberman] will not have a representative in the Knesset. Our list has no theft suspects like Liberman’s party does – this list is clean and pure,” said Tibi.